This DEWALT Cast Aluminum Reel Red Chalk is 100 ft. It has a die cast aluminum body for durability and to protect its twisted cotton line of reel. The felt gasket helps to distribute chalk uniformly. It can be used as a plumb bob because of its tear-drop shape. The Chalk reel is able to withstand abuse and resist corrosion because of its stainless steel hook and crank arm. DEWALT products are built to last. Extruded lumber crayons last up to 10 times longer than ordinary molded wax crayons. Fade-proof, water-proof, smear-proof. Won't melt in direct sunlight. Will work on wet (green) lumber or dry wood, metal, concrete and most other surfaces. Each crayon is individually UPC coded. Hex shaped 4-1/2inch. x 1/2inch. to fit lumber crayon holders. Eleven colors to choose from. One dozen per box. 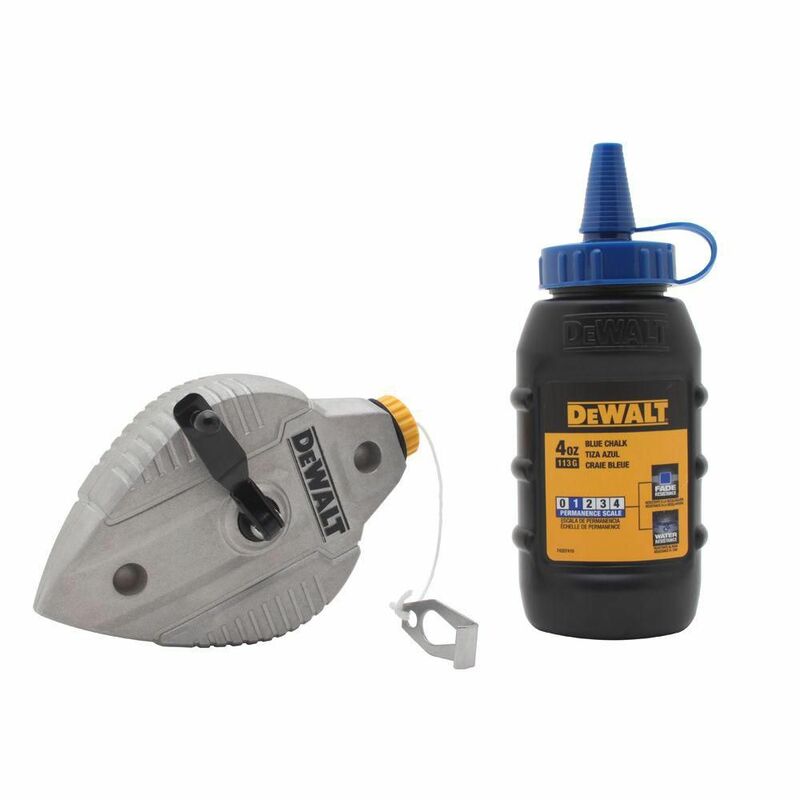 Cast Aluminum Chalk Reel in Blue This DEWALT Cast Aluminum Reel Red Chalk is 100 ft. It has a die cast aluminum body for durability and to protect its twisted cotton line of reel. The felt gasket helps to distribute chalk uniformly. It can be used as a plumb bob because of its tear-drop shape. The Chalk reel is able to withstand abuse and resist corrosion because of its stainless steel hook and crank arm. DEWALT products are built to last. Cast Aluminum Chalk Reel in Blue is rated 4.1 out of 5 by 107. Rated 4 out of 5 by RobJobRed from Easy to use and leaves a good line.... Easy to use and leaves a good line. Rated 5 out of 5 by Ironworker from Works great for everything I need it to do.... Works great for everything I need it to do. Rated 3 out of 5 by MPP from It's old school and is a little tedious to roll... It's old school and is a little tedious to roll up but does exactly what it suppose to. Rated 3 out of 5 by Colonelbob from Chalk line is usable but not the best I have... Chalk line is usable but not the best I have owned. My Stanley, which I have misplaced, is a better tool. I bought this because I needed it for a job in progress and couldn’t locate my Stanley. Did the job but marking is very light. The product was inexpensive and usable.